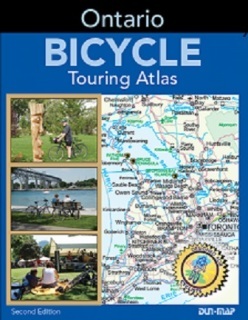 With the Ontario Bicycle Touring Atlas you can grab your bike and enjoy cycling throughout Ontario. The routes were developed over two decades of finding quiet scenic roads for enjoyable cycling and responding to requests for routes through various areas. The routes have been selected specifically to provide loops and connections across Ontario between towns and from region to region. There are long distance linear routes across the province and loop routes, suitable for day trips or weekends. The atlas identifies roads with paved shoulders or where motor vehicle traffic is light so drivers can easily leave space around you. Highlights and bicycling opportunities in eleven different touring areas in Southern Ontario are included. Five routes across Ontario are mapped and described in detail. The routes are selected for use by road and hybrid bicycles. They include mostly paved secondary roads, paved bike paths where available and unpaved bike paths where suitable. We are now shipping the newly updated 2016 Seventh Edition. In this 2016 edition over thirty five percent of the maps have new paved road or bike trail routes added. This includes the Ontario Greenbelt cycling route in the Toronto centred region, the K&P Trail in Frontenac County (north of Kingston) and extensive on road routes in Simcoe County (Barrie and Orillia area), Lennox and Addington (north of Napanee), Haliburton and the Ottawa Valley (north and west of Ottawa). All of the Bike ON Tours Package Routes as they existed are shown in the mapping. Effective September 1, 2015 all drivers of motor vehicles are required to maintain a minimum distance of one meter, where practical, when passing cyclists on highways. Bicycles are permitted on all roads in Ontario except on four lane expressways where specifically prohibited. In recent years the Ontario Ministry of Transportation and a growing number of municipalities in Ontario have added paved shoulders to roads as they are reconstructed. According the the Ministry of Transportation Official Drivers Handbook bicycles are expected to ride about one metre from the curb or parked cars and as close as practical to the right-hand edge of the road where there is no curb. They can use any part of the lane when required for safety to avoid obstacles such as puddles, sand, debris, rough pavement and sewer grates. Cyclists are not required to ride close to the right edge of the road when they are travelling at or faster than the normal speed of traffic at that time and place, or when they are turning left, or getting in position to turn left. Cyclists are permitted to make a left turn from a left-turn lane, where one is available. All of the information on the sights, experiences, tastes, accommodation and camping in the Ontario Bicycle Touring Atlas "Community Index" has been updated. For easy access go to Destinations and click on the live links to learn more about 0ver 400 places on routes in the atlas- where to go, what to see and where to stay. The information includes grocery stores, restaurants [local cuisine and unique], accommodation [good value and unique facilities convenient to the routes in motels, inns bed and breakfasts], camping [campgrounds close to route] , attractions and events, historic sites, wineries, natural areas, bike shops and bike rentals. Public libraries are also listed since they may provide washrooms, water, internet access and shelter from the elements. The atlas has 125 pages with 92 pages of maps 1:250 000 scale, 1 page for Northern Ontario and 25 pages of information on all of the communities on the routes. Accommodation located close to the routes is listed. Priority is given to good value bed and breakfasts and motels. Unique luxurious inns are also included. Those who wish to camp will find the information that they need. The restaurants listed are those that provide a unique dining opportunity or the best cuisine in the area. From our experience we know that you may need a bike shop while you are traveling and the opportunity to stay in touch through the internet. Since the community index is oriented to cyclists you will find that many towns have listings that are as extensive as those for large cities. Should you wish to spend more time in an area, tourism information sources are listed. Convenience stores along the routes are included for when you need something to drink or eat to keep you going. We have helped many cyclists who want to bicycle across Ontario and have added suitable routes to the atlas. There is a choice of several routes across Southern Ontario and you will be pleasantly surprised how quiet and motor vehicle free many of the roads are, particularly if you avoid the larger cites and Provincial Highways. You can bike across Ontario between Manitoba, United States border crossings and Quebec. If you are planning a bike trip from United States you will find direct routes plus bridge or ferry crossing information. The routes connect to Quebec's Route Verte in several locations. Turn by turn route descriptions are available for some routes - contact us if you want this additional information.